Good To Begin Well, Better To End Well: Friday Fun! Now With More Goats! 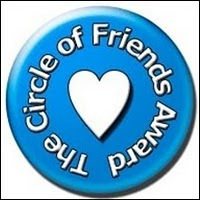 First off, a shout out of thanks to Stephanie at Hatshepsut for awarding me the fabulous Circle of Friends award! She has been a fantastic friend, and I am very excited to be in the Query Wars with her! I'd like to extend this award to my new friend Trinza over at Tall Tales, who has been putting together some great posts on writing and the process lately. He's got some great common sense rules for keeping yourself writing, and for those of you who enjoyed the There is no greater weapon than courage quote from Sigurd, I think you'll find Trinza's post speaking to you! I wasn't really sure what I was going to write about today but then it occurred to me that I hadn't yet discussed one of my most favorite moments of revision while working on GENERATIONS. That's right, my friends! Today we're talking about Thor's magic goats! You see, when I first wrote my book, I left Thor's goats out. Because let's face it, a thunder god being pulled in a goat drawn chariot is a pretty ludicrous idea. It's laughable. There isn't anything godly or noble about it. I wanted Thor to be treated seriously, not comically, and how do you introduce magic goats in a serious manner? Believe me, it's not easy. Especially not when it made me giggle just to think about it. But the more I wrote, and the more involved in Thor's character I got, the more I realized Thor needed to have his goats. It didn't matter how funny I thought it was, or how ridiculous it seemed, these goats are part of Thor's character. Tanngrisni and Tanngnost are Thor's companions, and this is one of the things that makes Thor unique and understandable as a god. Thor associates, not with some more noble horse, fabulous cat, feral wolf, creepy raven, or golden boar, but with the same animals that the Vikings and Norsemen depended on for a living-- the regular livestock. The ignoble goat. The goats were one more part of what made Thor approachable, one more point to reinforce the fact that he was The Every-man's God. So during this last and final revision, I gave Thor his goats back. And weaving them back into this story gave him a way to reach out to another character, and ultimately find information that he needed. Adding goats into my manuscript was hands down the best decision I made during this final revision, and I think Thor's a little bit happier for it, too. If you're interested, there are quite a few animals mentioned in Norse mythology. Odin has Sleipnir the eight-legged horse (and child of Loki). Freyja has a boar named Hildisvíni, and her chariot is drawn by cats--which still strikes me as more frightening than goats. And Freyr rides another boar named Gullinbursti, with golden bristles, which is a product of dwarven craftsmanship. Oddly, Freyja's cats are not, to my knowledge, named, though most of the other companion/familiars/livestock of the gods tend to be. Odin's ravens are named, Huginn and Muninn, and even Freyja's necklace has a name. I really don't do enough posts about Norse stuff! Sara: It was really nice. And the least I could for Thor, really. He's got a long and unhappy road in front of him. Shannon: I love Thor too! Sarah: Did you know he can eat them, and as long as he keeps the bones whole, he just taps them with his hammer and the goats spring back to life? I just love it when those little details click and cause chain reactions! And the Norse mythology is so fascinating. Thanks for sharing and congrats on the award! As a Capricorn, goats are near and dear to my heart. They symbolize purpose, although probably not in Norse mythology. :) Glad they're back where they belong. Nisa: I'm glad you liked the post, and thanks! VR: Thor was pretty purposeful, so that's fitting! :) I'm glad they are back where they belong too! and thanks! Cool. Thanks for the education on goats. I like how you had to truly understand the need for them in your story to include them. Amalia, I totally did not know! Wow! I really need to look more into Norse mythology! I am imagining a man (god) with a goat clopping around in his stomach. Mary: Yeah-- I really didn't understand their purpose when I began, and it's so easy to cut things you don't find meaning in. Sarah: hahahaha! I don't think they came back to life in his BELLY. :P He didn't eat the bones, after all, or the goats wouldn't come back whole! I used to keep goats, they are lovely companionable creatures with great personalities. They were (and still are in some places) actually used as beasts of burden. Goats are still hitched to little chariots here in Oz for racing (we Aussies will bet on anything). If you don't believe me do a Google on "Goat Racing". Some of my mom's friends used to have goats, and I remember being charmed by them as a kid. Beasts of burden, I believe-- beasts of WAR on the other hand still makes me kind of chuckle.